This Fisher Scientific -20°C Lab Freezer provides a steady and efficient general-purpose storage of samples in an upright unit. This lab freezer is 20 cu ft in capacity and has a -12° to -20°C, with 4 fixed height shelves and plenty of indoor storage. The upright lab freezer uses environmentally friendly, non-cfc refrigerants, foamed in insulation, and an easy to clean durable ABS plastic interior with an epoxy coated exterior. This Isotemp lab freezer is an ideal choice for situation where precise control is not a critical requirement. This laboratory freezer has a mechanical thermostat, and manual defrost. 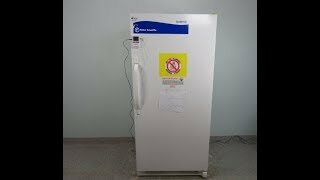 This Fisher Scientific -20°C Lab Freezer has been fully inspected and comes with current temperature validation. All of our lab equipment comes backed with our standard warranty. Should you have any questions about this or any of our other lab freezers, please contact us, we can help you find the right freezer for your application!